Do you like to go camping? Or, do you have dreams of making this the year you give it a try? In a couple months the weather is going to change, the flowers will bloom, the trees will turn green, and warmer weather will abound making it a great time to go camping. My eldest daughter’s birthday is in April and one of her favorite things to do for her birthday is to go camping. Her secret desire is to visit every state campground in Oklahoma before she graduates so she can fill her Oklahoma State Parks passport book with stickers. It’s a lofty goal, but we love to camp so we are going to give it a go. There is something about sleeping under the stars that is romantic, enticing, and freeing. It’s fun, it’s different, and it is great cheap family entertainment at its finest. However, we have quickly learned that it helps to have a plan, because without one, camping can quickly become very stressful. Thus, we’ve created our go-to camping checklist to help us quickly pack all we need whenever the weather is just right. The most important things are on our checklist include first aid, camping gear, and kitchenware. After all, without these, there is no camping. For meals, we like making soup in advance, keeping it warm in a crock pot plugged into our car’s cigarette lighter, and having it ready to eat as soon as we set up the tent. We then enjoy the typical hot dog meal the next day for lunch without the stress of trying to get everything done the first night on site. Our favorite camp breakfast has to be bacon, egg, and sliced cheese sandwiches, all of which you will see on our checklist should you like to do the same. As far as clothing, we usually plan on sleeping in what we wear during the day, bringing an extra sweatshirt to keep us warm or a rain jacket should it rain. However, if we are going camping when the weather is warmer, we might bring a backpack with a change of clothes, swimsuit for swimming, or flip-flops for a campsite shower. Are you going camping soon? 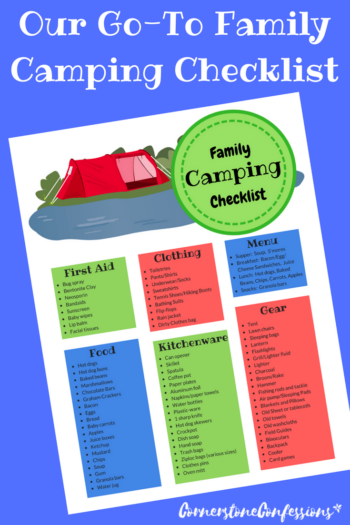 Download our family camping checklist as a guide to make sure you are prepared and ready to enjoy a stress-free weekend! Happy camping!